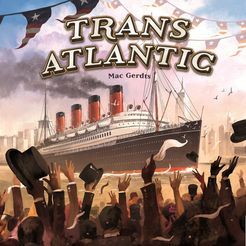 We started by playing TransAtlantic, a game that could be considered a Concordia variant. Actually it is more than a simple re-skinning of Concordia; the area control and trading aspects have been largely removed, to be replaced by set collecting and transportation mechanisms, but the core card hand management system is retained. I really like the historic theme, the ship artwork etc., and I love the card hand management choices available. The game has a few built-in variants available to change things around. The first is the option to play using East coast USA rather than global boards. I think this is weak and a cop-out: I believe this is included simply to appeal to the US market and I feel it is patronising to think American players are only interested in US-centric games. I like the idea of alternative boards but they should involve changes to game play which, sadly, TransAtlantic does not do (a missed opportunity). The second variant is a different ship ‘market’: I like the ‘increased cost’ mode rather than the ‘limited coal’ option, but both are good. The final variant is to use the ‘President’ card rather than the standard ‘Director’ card. I have yet to try this variant but it does look interesting, and makes ship deployment a more significant choice in the game. Our game took approximately 2 hours to complete, but this may have been due to our inexperience with the game. The points tally showed Chris to be the winner, closely followed by Val. Post-game analysis focussed on the need to keep track of what flag of ship you focus on and improving their relative value in the end-game scoring. All players saw the value of acquiring shipping houses early in the game to gain a steady flow of victory points. For some reason I struggled to keep my key ships coaled and this was probably due to my poor use of cards. Anyway, I think everyone enjoyed the game (once they started to understand the mechanics) and would happily play again. I think Concordia is possibly the slightly better game, but Chris already owns that game, so TransAtlantic does represent an interesting alternative. Next we played Paperback, which has already become one of Elaine’s favourite games! We were slightly nervous about this because Val’s native tongue is French, so we hoped she would not feel too pressurised coming up with English words. We need not have worried because Val emerged as the winner! Playing with 4 players does slow the game a bit, but this does give you more time to ponder your own cards and word options. The ‘attack’ cards have more impact in the 4 player game compared to the 2 player game, and the letter stacks can become exhausted towards the end. I was pleased to be the only player to produce a ‘thematic’ word in the game; this bonus was often forgotten about in previous games. There were a few words ‘suggested’ by players to earn a cube bonus, and we struggled to find long words (8+ letters); in fact, we have yet to end a game via the 10-letter option. I can see Paperback remaining a go-to game for Elaine, especially at home playing the 2 player game, and as a final semi-filler game in multiplayer sessions. I really like Tim Fowers games, the ideas and mechanisms seem fresh and different to those from other designers.